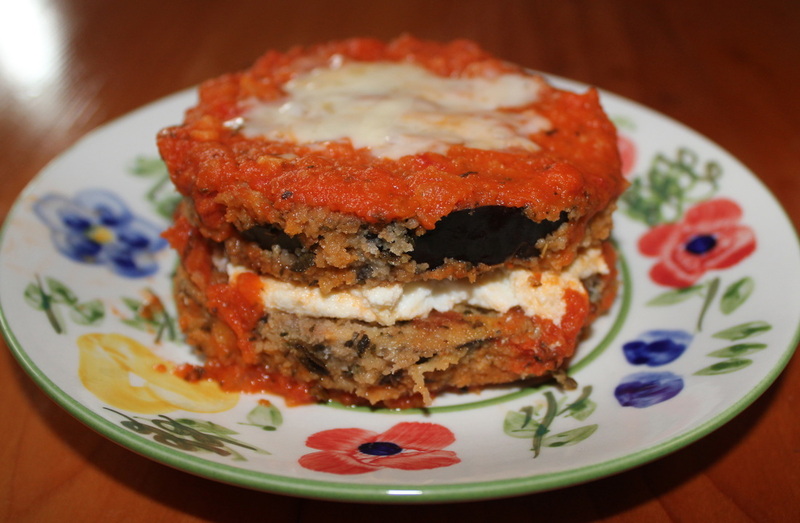 My delicious, healthy eggplant parmesan recipe is a great way to add this nutrient dense vegetable to your diet. Using 3 shallow bowls; place flour in one bowl, eggs in second bowl and breadcrumbs in the third bowl. Add basil, oregano and garlic powder to the breadcrumbs, mix well. Coat each side of eggplant with flour, then egg, finish coating each slice with breadcrumbs. Place prepares eggplant slices on prepared baking sheet and bake for 10 minutes per side. Spoon 1/2 of the pasta sauce into bottom of a 13 x 9-inch glass baking dish. Top each slice with a scoop of Ricotta cheese. Arrange one eggplant slice on top of Ricotta cheese. Carefully spoon remaining sauce over each eggplant stack. Sprinkle Parmesan-Reggiano cheese over sauce. Bake at 450° for 30 minutes; cool 10 minutes before serving.